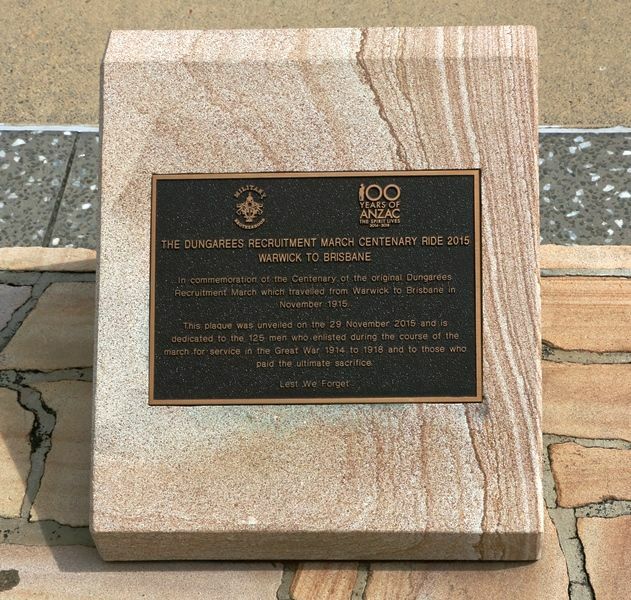 The plaque commemorates the centenary of the Dungarees Recruitment March in 1915. The plaque displays the Centenary of ANZAC logo and was funded through the ANZAC Centenary Grants Program. The Dungarees Recruitment march was the only “snow ball” march in Queensland during World War One. On 16 November 1915, 28 men left Warwick and marched through Allora, Clifton, Greenmount, Cambooya, Toowoomba, Helidon, Gatton, Laidley, Rosewood, Ipswich and Oxley. The 270-kilometre (160 miles) march ended in Brisbane with 125 recruits. 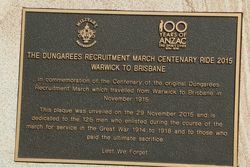 In commemoration of the Centenary of the original Dungarees Recruitment March which travelled from Warwick to Brisbane in November 1915.